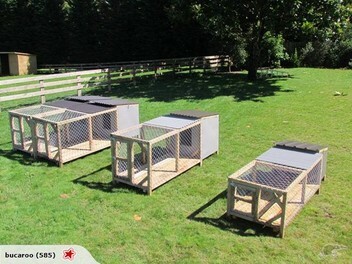 Great dog kennel and quick delivery. Very happy with it thanks. buddy. these kennels keep getting better have had mine for 10 years + have got 3 kennels great for all types of dogs very friendly and great to deal with. Excellent service, trader and product. Dog very happy, thanks. Thanks for the awesome kennel and for delivering for me! Whole process was so easy! Great to deal with! Brilliant kennel, well made, went the extra mile, and friendly and easy to work with - thanks kindly ! PS ... the dogs love it ! Great kennel. Delivery was prompt and added advise on dog obedience and care given by aaron (builder of kennels) a real bonus to someone new at dog ownership . Thanks Aaron. Great kennel and run thank you Aaron. Dog loves it. Awesome to deal with. Great kennel. Thanks very much! Fantastic kennel was very happy with the large size! great buy! Awesome dog kennel and run. Fantastic value. Thank you very much!